There were two things I wanted to tell you about. First, amongst all the umbelliferous flower heads (things that could be Hemlock) waving seductively from our verges at the moment, there is one without the ferny, carrot type leaves. I’ve decided that this is Ground Elder and I have some pictures to show Google to see what he thinks. However, pictures you take so that you can identify a plant tend to be pretty boring, have a look at the picture of Horsetails (Still Waiting) from a few posts back. Believe it or not, I do try to limit the boring pictures you’re subjected to, so I don’t want to use those for this post. Secondly, on our way home this morning, The Dog found something incredibly, nasally interesting, I think it was a blade of grass, I stood there waiting, as patiently as possible, but eventually I became insistent and we moved off – only for me to spot a large bumble-type bee pottering around in a patch of vetch. Naturally, I had to stop, we haven’t had that many bees around. The Dog gave a huge sigh and sat down in the middle of the road. In the process of attempting to stick the camera through the undergrowth, as close to the bee as possible, I was stung several times by nettles – don’t we just have to suffer for our art? Unfortunately, bees are naturally fuzzy and they tend to fidget a lot too, so those pictures turned out, well, fuzzy. 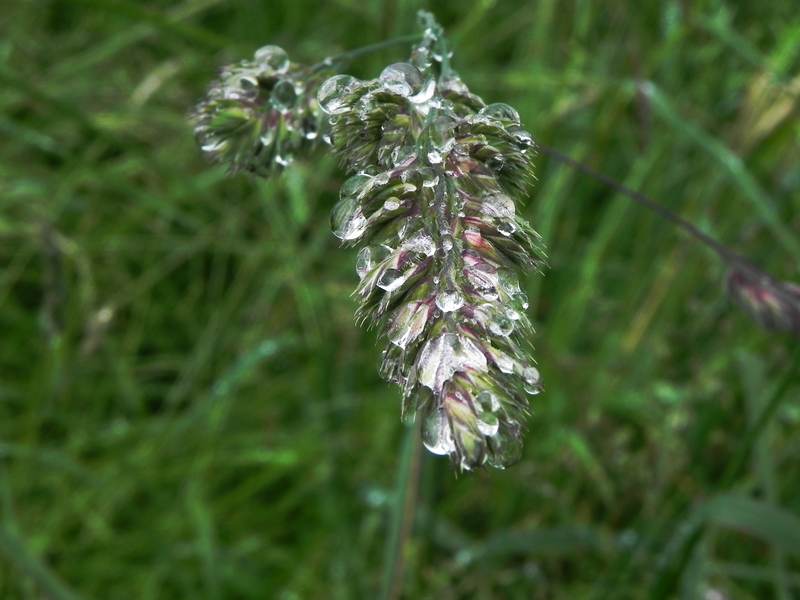 So, here’s a picture of the peculiar way this grass seed-head has trapped last nights rain. Oh, and just across the road from the Vetch is a patch of Ribwort, I’ve mentioned before that it’s good for stings and bites, so I picked a leaf and rubbed it on the stingy places. Guess what – Google was right. It really works! Thanks for posting – you could have said – Relevance is not always relevant – I suppose, so I thank you for sparing all of us the pain.